Bianca is Senior Legal Counsel in the Corporate / Commercial Legal Team at Farfetch. 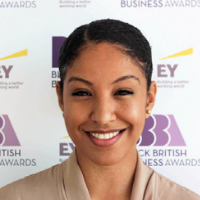 She provides legal support to a number of business units including Dream Assembly (the Farfetch Accelerator), Browns, Black & White and the Strategy and Innovation teams. She trained and qualified as a Corporate M&A Lawyer at Slaughter and May before moving to US firm Covington & Burling. Bianca is also Co-Head of the Education Programme at Urban Lawyers, a charity aimed at educating people from vulnerable groups and marginalised communities about their legal rights as well as inspiring people from more “non-traditional” backgrounds to enter the legal profession.